If you like Van Gogh's famous "Waterlily," you'll love our Lily Pads design. 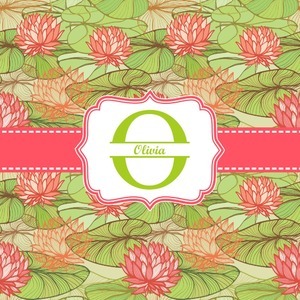 A bold pattern of lime green lily pads and popping orange flowers, it channels both nature and modernity. The design has a classic orange ribbon trimmed in white. The decorative label is the perfect place to add an initial and a name for that personal touch to pull the entire design together.